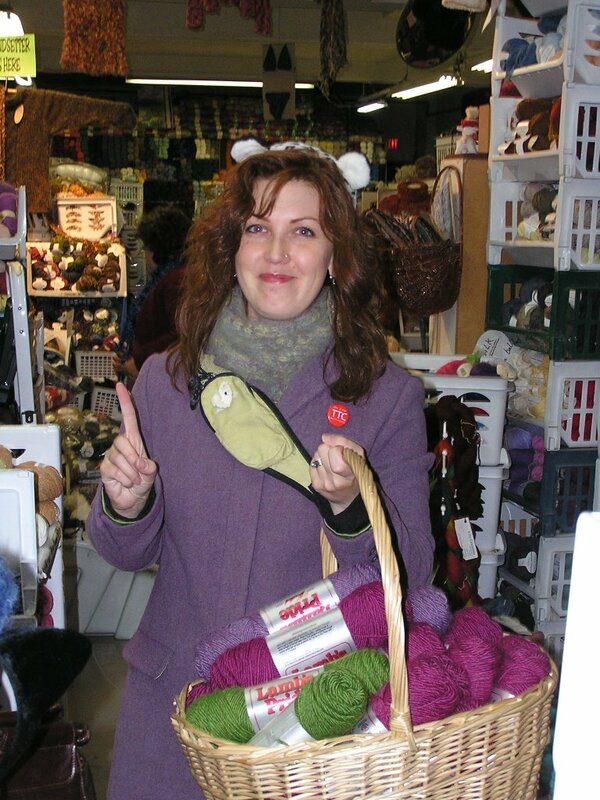 Here I am, intrepid traveler before setting out (at 7:30 Saturday morning) for the 3rd TTC Knit-a-long. 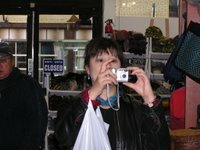 Part of this trip's gear is my 'Campfire scarf' made from Artfibers Kyoto and Alfabeto yarn. 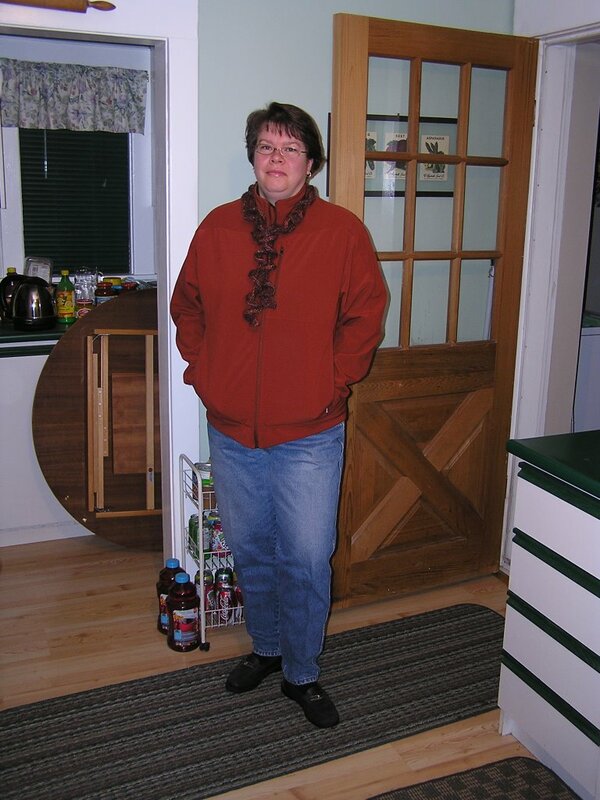 I have named it such as it is knitted in a curly-cue style, and has orange, purple and brown hues. This yarn was acquired for me by my TTC Knit-a-long traveling companion Eden, who obtained a rather large stash at Artfibers on a spring trip to San Francisco.....but that is another story best told by her. 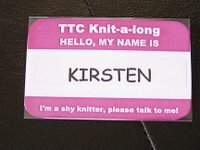 We decided sometime ago, that if we were ever to do another social knitting thing, we better have some name tags (as we tend to be a bit, shy). So here is mine, Eden did a much more festive one appropriate to the upcoming Halloween holiday. 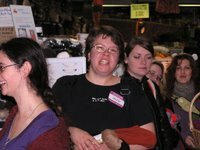 So onward we go, and here is our first stop at Romni Wool. 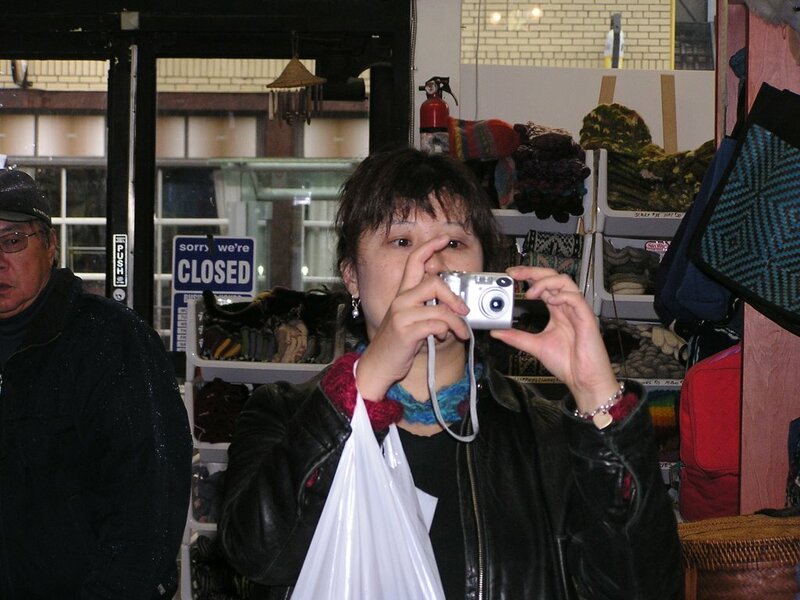 Our fearless leader Beryl is shown here documenting our hunting and gathering techniques as we line up at the cash register. I had a small but significant haul, acquiring a skein of camel yarn (in camel colour) and angora/silk yarn (in black) both of the store's own brand. Very yummy! 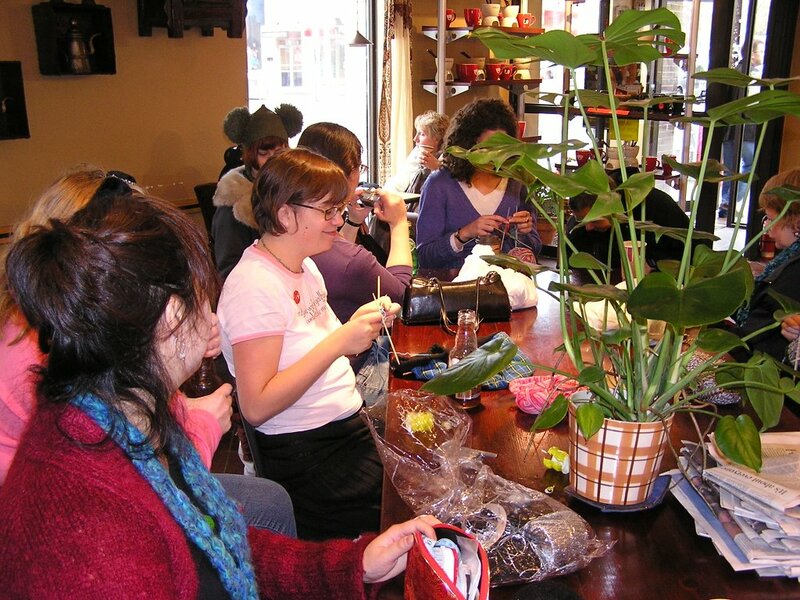 Eden had gathered a significant amount of yarn for her upcoming twined knitting project. Again, it is best to let her explain it. 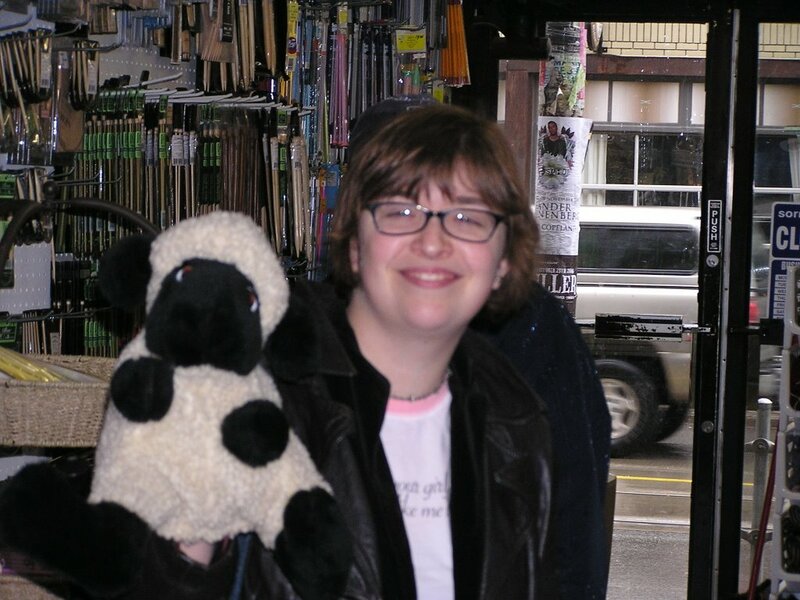 There was buzz that she could be up for the "Needs a sherpa" prize at the end of the day, but alas, we burned out and headed home before that could be determined. 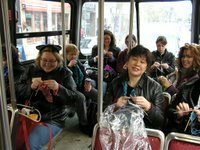 From Romni, we continued through the wilds of Toronto's Queen West area, stopping in a new yarn store that specialized in South American yarn (this was done on a whim as someone had heard about it just opening and was across from Arton beads). Despite it's promise of yarn from the other side of the world, it was a bit of a disappointment. Eden and I made a quick venture to Arton (she acquired a lovely glass bobble for $2.25) and then had a rest at the Second Cup. Here we are resting before resuming our arduous journey. 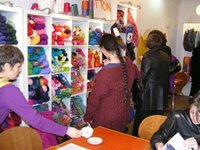 Having refreshed ourselves with hot drink and engaging in a bit of knitting, we headed back to the Knit Cafe, to continue our journey. 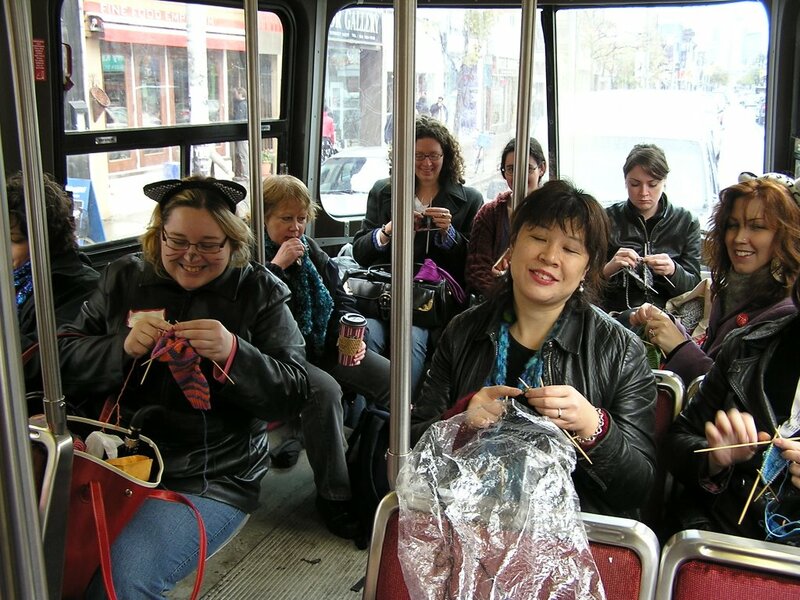 Some pictures were taken to prove that this was a TTC Knit-a-long, and not some excuse to travel to multiple yarn stores in a single day. We made it to the Knit Cafe and made quick work of exploring the area to ensure all yarns were examined. 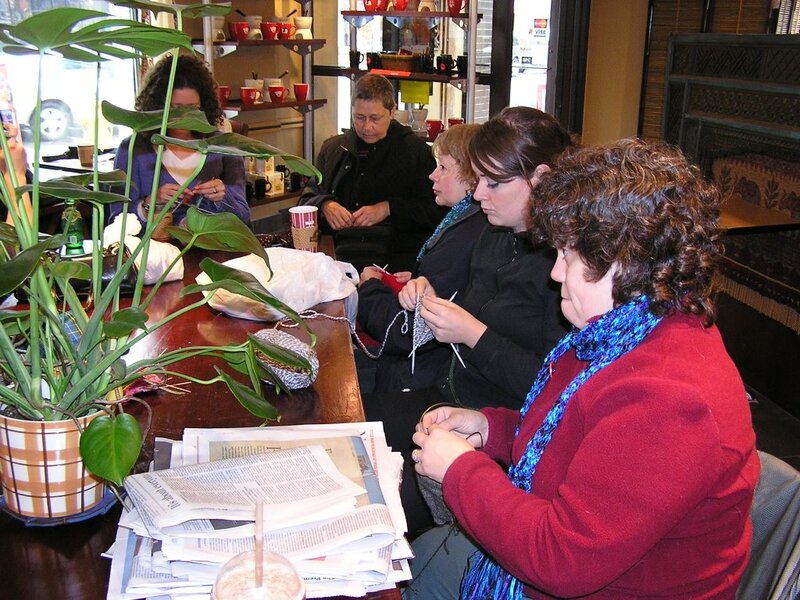 We then settled in for a bit more knitting and a group shot. This would be the last picture taken for the day (at least from my camera) as hunger and exhaustion from the days excursion settled in, and we all made our way to the Red Room on Spadina (south of College) for lunch and to meet the other teams. There, I would receive a cook book for the prize of "Best non-sequiter" (which is apparently Latin for 'it does not follow'. It appears I seem to talk about anything that comes to mind, rather staying on the day's theme of knitting, yarn or anything else in that vein). I will be mindful of that in the future. After being well refreshed, a small group of us headed to Lettuce Knit which was insanely busy. There, Eden obtained a final skein to finish her knee high socks (I think it took 4 all together), and I finally gave into the urge to purchase a skein of MANOS del Uruguay yarn to be knitted into a Moebius Capelet (first observed at the Knit Cafe, I somehow resisted it's charm and walked away from it). It is probably the yummiest colourway I have ever seen, but doesn't have a name other than '113'. Eden says it looks like a perennial fall garden, perhaps that is the name I will give it. After Lettuce Knit, we yelled goodbye to everyone in the store and went home. Tired but satisfied, it was a thrilling adventure through the wilds of Toronto to some of the best yarn stores that this city has to offer. 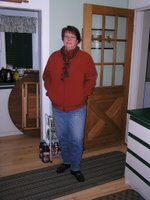 Would I do it again, oh ya! But next time I will come from another direction (north or east) to experience the adventure of the other yarn spots within our fair city. 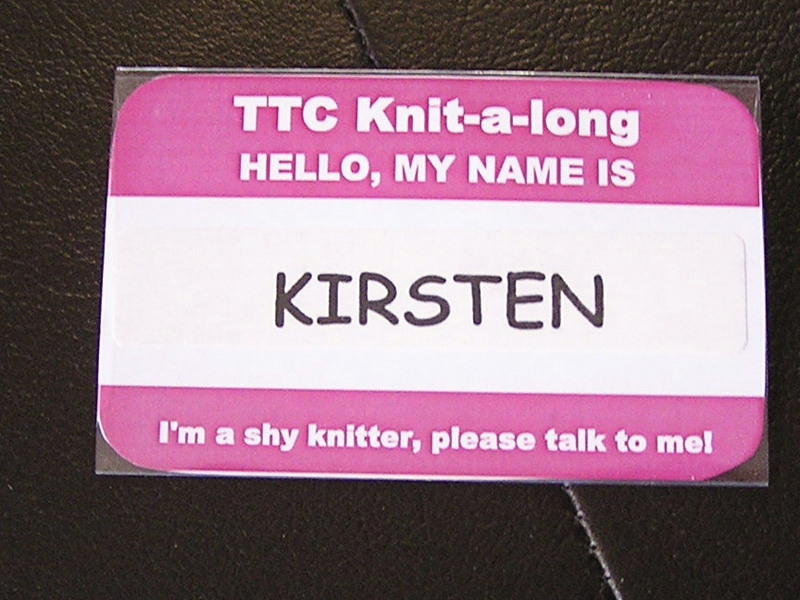 posted by shyknitter @ 8:23 a.m.
Nice to meet you, and I agree it is good that we masqueraded as TTC knitters and not just one big yarn crawl. Hah!